Well actually it’s marmalade but there you go. For the first time in my knowledge, Ocado had Seville Oranges on their site, I usually pick them up at the local supermarket but as they have such a short season they are easy to miss so I added some to my shop. If you’ve never come across them, they are very bitter and full of pips but make the most amazing marmalade (I’m not sure what else you’d use them for). They are only on the shelves for about 4 weeks of the year, usually the end of Jan to the beginning of Feb but are well worth looking out for. I was so pleased to catch them that I bought 2 Kg and with about 6-8 jars per kilo that’s quite a lot of marmalade, especially considering I’m the only person that eats it, the boys don’t like the peel. Ream oranges and lemon into double layer of muslin set over a sieve, scouring shells to get as much pith as possible. Tie contents of muslin into a loose bag and put into preserving pan with 2 litres of water and the strained juice. Discard shell of lemon. 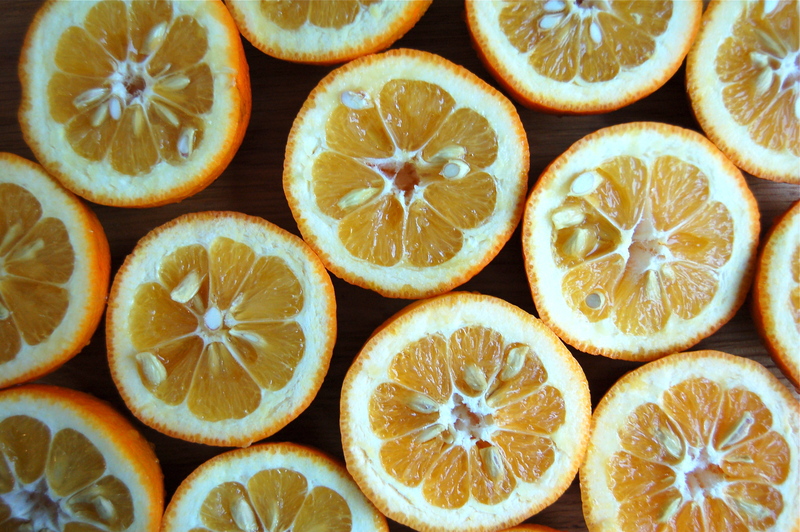 Slice orange shells into half again, then slice finely. Add to pan, bring to boil then reduce and simmer, uncovered, for about 2 hours, until rind completely soft. Remove muslin bag and squeeze out as much of the liquid as possible, back into pan. Add sugar and stir over low heat until completely dissolved. Raise heat and rapid boil for a set (15 mins). Test small amount on chilled plate (pop these in the freezer before you start, it should form a skin that wrinkles when pushed with finger). Boil for another 5 mins, if needed and test again, until set is achieved. 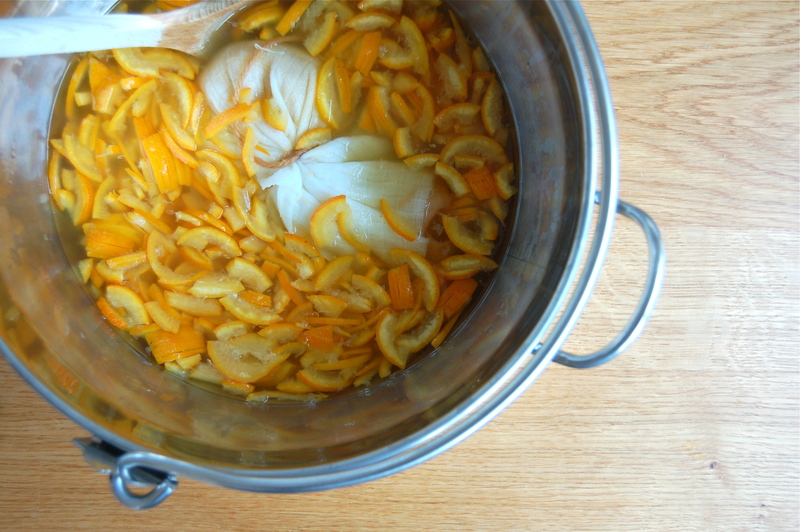 Leave marmalade for 10 mins to cool before potting in clean warm jars, with wax discs on top. Cover with clean tea towel and leave until completely cold before putting lids on. (For a Dark & Chunky Marmalade use 2Kg Preserving sugar and 200g Dark Muscovado sugar and cut peel into short chunky batons). I managed to make a whopping 8 jars, even I will take a while to get through that lot so I decided to make the next kilo into Seville Jelly, that way the boys might eat some. Again, I always make some jelly but normally only a half batch using 500 g of oranges as finely slicing the zest takes quite a while. Ream the fruit and strain juice through muslin into jug, cover and refrigerate. Combine the zest and it’s liquid with reserved juice and strained pith liquid (should be about 800ml in total). Put into a preserving pan with sugar, stir over low heat until sugar completely dissolved. Raise heat and rapid boil for a set – approx 15 mins. Test for set and if needed boil for another 5 mins. Remove from heat and cool for 10mins before potting in warm, clean jars with wax discs. Cover and cool completely before adding lids.